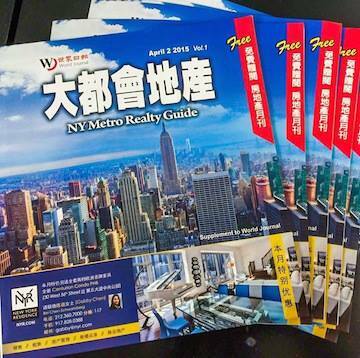 nyzUSA partners with World Journal, the largest Chinese Newspaper in the United States, to launch a monthly real estate guide to help realtors showcase their exceptional properties. 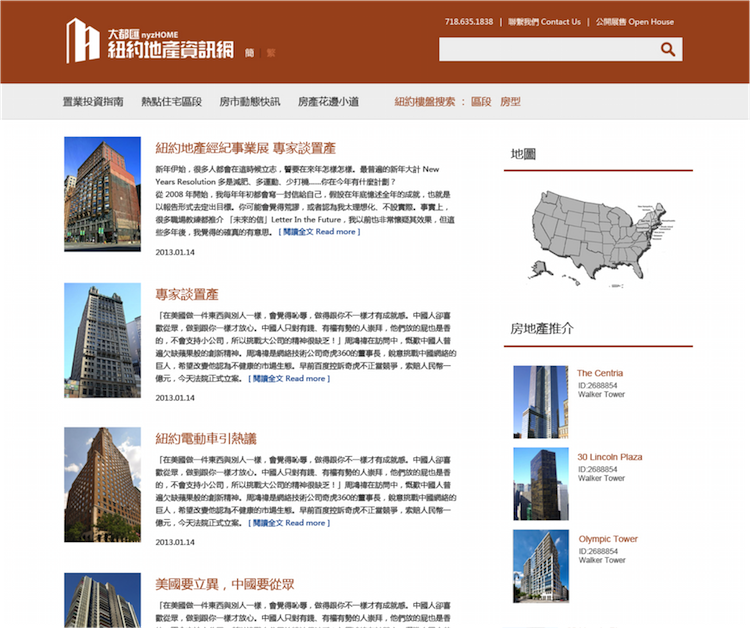 With 90,000 copies distributed in the Greater New York Metro (NY/NJ/CT/PA), the magazine is by far the largest Chinese realty publication in the U.S.
nyzUSA's online real estate platform, nyzHOME.com is a unique website to provide Chinese in the United States and around the globe insightful information about the real estate market in the Greater New York Metropolitan area. Website development is one of nyzUSA's specialties. We build websites for real estate agents, large corporations and everyone in between. Not only we can help you build from scratch (positioning, copywriting, photography, content management system, search engine optimization), we can promote your websites and monitor traffic/comments.  Content development is a great way to educate your target audience. nyzUSA produces various TV series that cater to product's nature to ensure relevance. 360-degree programs including event and social media can inform and engage your audience. Grassroots tactics are critical to new product launch. nyzUSA's street team does flyers, posters and manning booths at malls and events. We can help our clients from concept to execution. With experienced demonstrators, in-store demo can always drive up sales. nyzUSA specializes in Chinese supermarkets nationwide and in Canada. nyzUSA also markets Chinese products to the general market audience. To introduce Moutai, a Chinese liquor with 53% alcohol, to non-Chinese, we did film premiere sponsorship, tasting and outdoor advertising. All event/advertising locations are strategically picked and cost efficient. 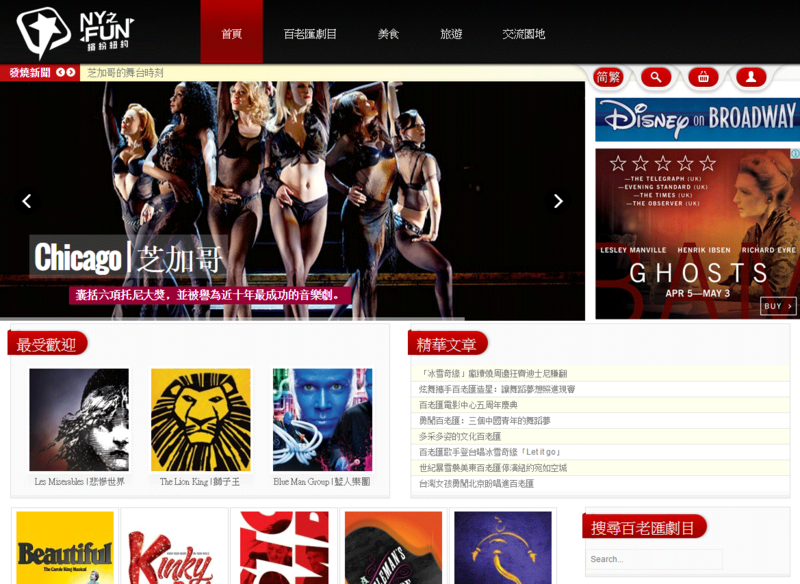 nyzFUN partners with travel agencies, Broadway show promoters, and attractions owners to bring New York's best to Chinese visitors and local friends. 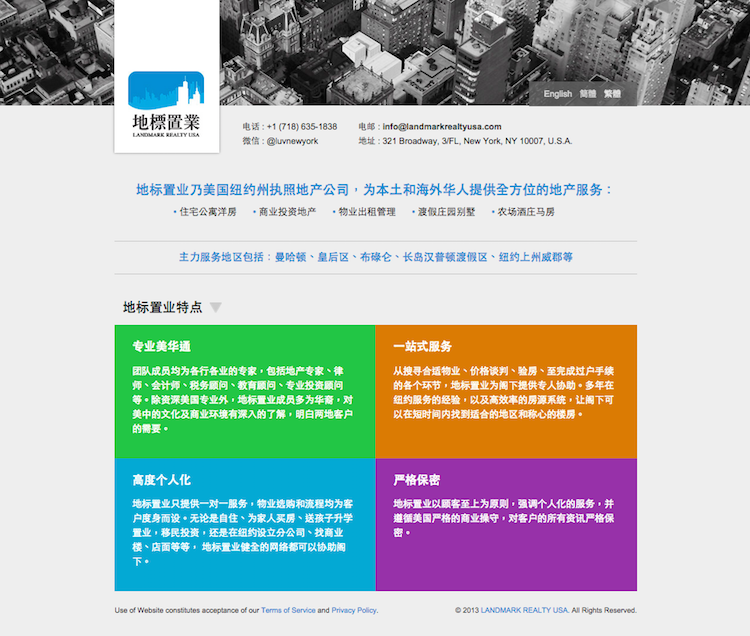 nyzUSA helps brands and professionals to build their websites and manage their social media accounts: Facebook, Foursquare, Google+, Instagram, LinkedIn, Pinterest, Twitter, WeChat, Weibo, Yelp, YouTube, Youku, and more. We guide our clients to develop marketing strategy and train their staff to manage their websites and social media accounts. In some cases, we do everything for clients and be their marketing department. So, they can focus on their core business and better serve every customer we help bring in. nyzUSA.com, nyzChannel.com, nyzFUN.com, and nyzHOME.com (collectively the “Website”) are owned and operated by nyzUSA Inc. (“nyzUSA”). By accessing this Website, you agree to be bound by the below terms & conditions (“Terms”). Please read them carefully. IF YOU DO NOT AGREE TO BE BOUND BY THESE TERMS, YOU SHOULD NOT ACCESS OR VIEW THIS WEBSITE. The information contained in this Website is intended for general information purposes only. nyzUSA have made all reasonable efforts to ensure that the information on this Website is accurate at the time of inclusion, however nyzUSA cannot guarantee the accuracy of such information. nyzUSA makes no representations or warranties about the information provided through this Website, including any hypertext links to any website or other items used either directly or indirectly from this Website. nyzUSA accepts no liability for any inaccuracies or omissions in this Website and any decisions based on information contained in this Website are the sole responsibility of the visitor. The Website is provided on an “as is” and “as available” basis without any representation or endorsement. nyzUSA accepts no liability for any interruptions in your use of the Website. The information, designs, content, artwork and images contained within this Website are protected by copyright of nyzUSA or of its clients/licensors. nyzUSA permits you to make copies of the information and images on this Website solely as necessary and incidental acts for your viewing of it; and you may take a print for your personal use of so much of the Website as is reasonable for private and non-commercial purposes. You may not frame this Website or publish a hypertext link to any part of it without express permission in writing from nyzUSA. Sharing URL of the Website pages in personal and social communications for informational reference is permitted. You acknowledge and agree that all trade marks, service marks, trade names, logos and all other intellectual property rights in all material or content contained within the Website shall remain at all times owned by nyzUSA or its clients/licensors. You are permitted to use this material only as expressly authorized by nyzUSA. nyzUSA reserves the right at any time and without notice to enhance, modify, alter, suspend or permanently discontinue all or any part of this Website and to restrict or prohibit access to it. You hereby agree to indemnify nyzUSA against any costs, claims, losses and damages (including legal fees) incurred by or awarded against nyzUSA as a result of your use or misuse of this Website or your breach of these terms. This Website is provided to you free of charge, and neither nyzUSA nor any of its subsidiary or affiliated companies accept any liability to you (except in the case of personal injury or death caused by its gross negligence or willful misconduct) whether in contract, tort (including negligence) or otherwise, arising out of or in connection with this Website. nyzUSA accepts no liability for any direct, special, indirect or consequential damages, or any other damages of whatsoever kind however arising through the use of the Website or any information obtained either directly or indirectly from this Website. Your sole remedy is to discontinue using this Website. These terms may be amended by nyzUSA from time to time at any time and without prior notice and the changes will become effective immediately after posting the revised terms. You can review the most current version of the terms at any time at nyzUSA.com. You are responsible for checking periodically for changes and your continued use of this Website indicates your acceptance of the new terms. Your use of this Website and downloads from it, and the operation of these terms, shall be governed in accordance with the laws of the State of New York. The New York federal and state courts shall have exclusive jurisdiction over any dispute arising out of your use of this Website. In the event that any or any part of the terms shall be determined by any competent authority to be invalid, unlawful or unenforceable to any extent, such term shall to that extent be severed from the remaining terms, which shall continue to be valid and enforceable to the fullest extent permitted by law. These terms are effective and were last updated on August 9, 2013.